Franklin's new Ballpark Commons signs naming rights deal for "Routine Field," home to the Milwaukee Milkmen | Vandewalle & Associates, Inc.
FRANKLIN, WI (EXCERPTS FROM BALLPARKDIGEST.COM): As Ballpark Commons – a Sports Entertainment District project envisioned by Vandewalle & Associates – nears completion, ROC Ventures and Routine Baseball have announced a naming-rights deal, “Routine Field.” As home to the Milwaukee Milkmen, the 4,000-seat stadium facility at Ballpark Commons in suburban Franklin is set to open spring 2019 and will also serve as the home for University of Wisconsin-Milwaukee baseball. As part of the naming rights agreement, sponsored signage and logos will be visible around the ballpark, including in several outfield locations and on the turf near first and third base. 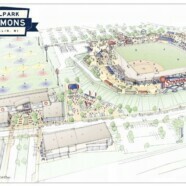 “We’re proud to have a local company like Routine Baseball represent our field and work side by side with our team as we continue to build a state-of-the-art facility that not only our players will enjoy, but the entire community for many years to come,” said Mike Zimmerman, chief executive officer at ROC Ventures.